Watch now to see how to make a classic Bunny Cake for birthdays and Easter. 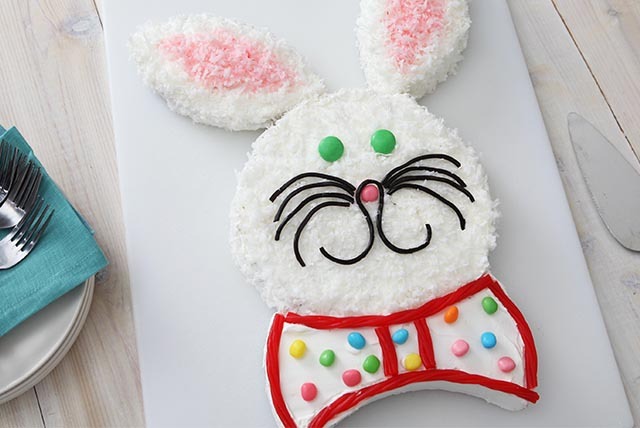 Find out how to decorate this Bunny Cake with kid-pleasing candies. Leave 1 cake whole. Use serrated knife to cut remaining cake into 3 pieces as shown in diagram. (See Tip.) Arrange on large foil-covered board or platter to resemble a bunny's head and bow tie, using small amount of COOL WHIP to attach pieces to each other. For a pink bunny cake, prepare as directed, adding a few drops red food coloring to the COOL WHIP. Or, to decorate the bunny cake with tinted coconut, mix 1/2 tsp. water with a few drops of food coloring. Add to some of the coconut in resealable plastic bag. Seal bag; shake until coconut is evenly tinted. Sprinkle center of bunny's ears with tinted coconut; sprinkle remaining coconut onto rest of cake.